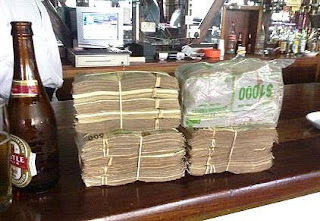 Until recently this is how many notes it took to buy a beer in Zimbabwe. The country has now moved to the dollar which has halted the runaway inflation but has drawbacks of its own. One being that nobody has any small change (a friend was apparently given lollipops instead). No big deal right? 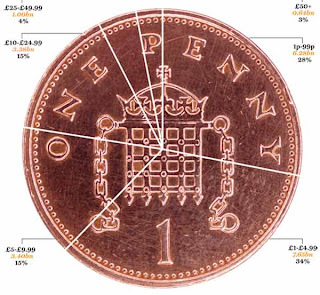 Except even in a rich advanced country, over a quarter of payments made are worth less than £1. How are such small value payments made in Zimbabwe? The same occurs in Malawi in the few big chain shops that exist there. You'll often get little bubblegums to round up your change. Where I was in Zim early last year I frequently received Botswanan Pula, American cents and South African Rand all in change and on one account, even British pence. I do remember it made using pay phones extremely hard. Every time I'd go to use one I'd present a 5 dollar bill and then proceed to collect all their coin change when I went to pay on the way out! The solution for shopkeepers was to offer a selection of items, each denominated at 5 centavos near the register. You would then mix and match to get the change you needed. It sucked when I needed actual change (for the bus) but otherwise was great, as I could get a single stick of gum, 5 gummi bears, and a box of matches - if those were the items I needed. But if I really needed to catch the next bus, running from shop to shop to see who would give me my change in actual coins was really annoying.... and led to a number of missed buses.